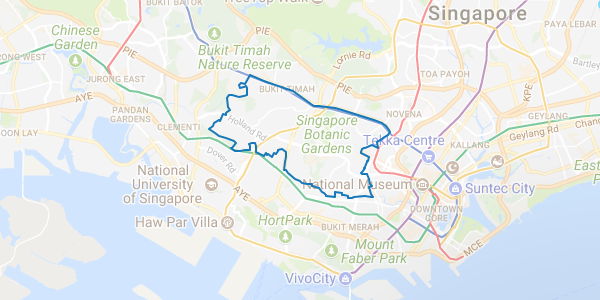 District 10 is comprised of Tanglin, Farrer Park, Bukit Timah, Holland Village and Ardmore Park, where Singapore’s Botanic Gardens adjacent to a large forest reserve can be found. To residents of District 10 this district offers the double benefits of natural scenic views as well as close proximity to the city’s most illustrious areas, where the high society of Singapore can be found enjoying drinks at the finest bars and dining at some of the area’s best restaurants. The Tanglin area is largely residential and is home to the Singapore Botanic Gardens. Like neighbouring Orchard, which is comprised of plantations first founded in the 17th century, the Chinese and Europeans slowly developed the Tanglin area over time into residences and luxury homes for the educated, wealthy, illustrious Singaporeans and expatriates to the city. Tanglin is also the heart of Singapore’s major embassies, ministries and consulates, where you’ll find the Ministry of Foreign Affairs, United States Embassy, the British Council and High Commission, the Chinese Embassy and the Australian High Commission. Tanglin has long been a target for affluent property buyers, which has prompted property developers to build a number of luxury homes in the area. You’ll find numerous landed properties among exclusive condominiums such as the Grange Residences and the newly completed Ascentia Sky@Tanglin, that offers duplex units and super penthouses. The 45-storey contemporary development is the tallest residence in the Tanglin district with a multitude of sky gardens at intermediate levels, and all featuring thematic recreational facilities. Other prestigious condominium properties include the Tanglin Hill Condominium, Cluny Park Residence and Tanglin Hill Meadows. High-society members participate in Tanglin Club, a members-only recreational club whilst a private hospital, Gleneagles Hospital, serves the medical needs for local residents. Here, prosperous locals and expatriates mingle in a foodie paradise in popular alfresco bars like PS Café, Margarita’s, Café Beviamo or luxury restaurants such as The Halia at the Singapore Botanic Gardens, Shang Palace, Jim Thompson or The White Rabbit. Shopping can be done at several places where Singapore’s oldest shopping mall, Tanglin Shopping Centre offers antiquities from feudal China such as Buddhist statues, Ming vases and rosewood furniture. For a mix of old and new, retail outlets in Tanglin Mall and Tudor Court should satisfy all types of bargain hunters. Commuting is easy for those with homes in District 10, with public transportation services via buses and taxis and with the upcoming construction of Napier MRT Station and Orchard Boulevard MRT Station. Another favourite expat hang-out is Holland Village where a large hawker centre, numerous trendsetting cafes, bars, health and beauty outlets cater to their needs and it is fondly known as “Holland V” among the expatriate circle. Retail establishments in Holland Village can be found in two shopping malls, the Holland Road Shopping Centre and Holland V Shopping Mall. Holland Village is surrounded by high-rise HDB flats and commuters get around using the Buona Vista MRT Station and the Holland Village MRT Station. Representing the highest hill in Singapore at an altitude of 164 metres, Bukit Timah is adjacent to the Central Business District (CBD) and this area is a favourite among elite property owners with a number of luxury condominiums and bungalows that surrounds the Bukit Timah Nature Reserve. A nature reserve definitely adds more value to its surrounding land. The abundance of green foliage beautifying the area has lured many wealthy property buyers to own a piece of this prime real estate. It also has the longest road in Singapore, measuring 25 km, running across the island from north to south. A new luxury property development due to be completed in 2018 is PALMS@ Sixth Avenue with a total of 32 exclusive units of freehold, cluster landed houses located along Sixth Avenue that comes with the allocation of two car parks per unit, private gardens and swimming pools. Other established condominiums include Pandan Valley and Adam Park Condominium. Plenty of public buses and taxis ply the area and those travelling by foot can use the MRT Stations – Hillview, Beauty World, King Albert Park, Sixth Avenue, Tan Kah Kee, Botanic Gardens, Stevens and Newton. Bound by Dorset Road, Hampshire Road and Northumberland Road, Farrer Park was named after R.F. Farrer, the President of the Municipal Commissioners in the 1920s, and this was where Singapore’s first racecourse was built in 1842. Here avid tennis players can practice their game in the Farrer Park Tennis Centre that has eight tennis courts and two tennis practice walls. Farrer Park has a few new and upcoming property developments such as Cityscape, a freehold 31-storey condominium project with a total of 250 units, which is expected to be completed this year. A mixed project, The Citron, comprising of 36 freehold shops and 54 residential units is due for completion in 2019. MRT Stations like Little India and Farrer Park is nearby for easy commuting, besides the usual public transportation of buses and taxis. The Ardmore area is close to Orchard Road and Scotts Road, where the hub of business and commercial properties reside in Singapore. It is close to many six-star hotels, shopping malls, clubhouses, top international and local schools where many foreign buyers invest in luxury properties, even during the economic slowdown. One prominent condominium project recently completed is the Ardmore Residence, boasting a multi-layered architectural 36-storey residential tower; Ardmore Park, Ardmore II and Ardmore III condominiums representing exquisite homes with first-class facilities and luxurious interiors. Walking to the nearest food and entertainment spots is so easy if you don’t want to take a bus or taxi, and Orchard MRT Station is the nearest to serve your travelling needs.